The most longstanding summer alternative to hot coffee has always been iced coffee. However, there have always been some hindrances. For instance, when you brew hot coffee and put it in ice, you get a brew that is both acidic and watery. The brew’s flavor is not so good. So, what’s the solution? You got it right, cold brew. Always use cold/lukewarm water, and brew for a period of 12-24 hours. The result is a flavorful, non-acidic coffee concentrate. The way you drink it depends on your preferences. 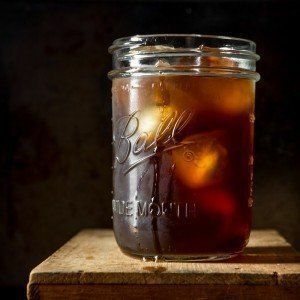 In this article, we outline the Top 5 best cold brew coffee makers you can use to brew the cold stuff at the comfort of your home. Click image to buy for the lowest price on Amazon today! 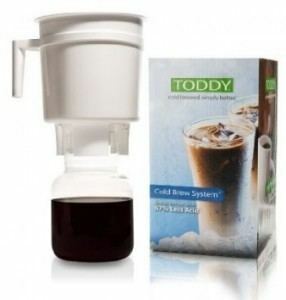 Toddy is one of the most popular cold press brewing systems. In fact, it’s among the oldest cold brew systems—if not the oldest. The system is simple, and is built with durable materials. It therefore has a long lifespan. Included in the system are a glass decanter, brewing container, rubber stopper, paper filter bags, and felt filter pads. Toddy’s taste profile is similar to that of Filtron. The process of making coffee is similar too. First add the grinds. Then water. Leave to seep for a period of about 48 hours. Take off the rubber stopper. The brewing chamber stands atop the decanter. You collect your coffee from the decanter, once it has been filtered by the felt filter pad. 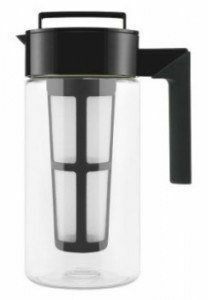 The Toddy T2N Cold Brew System is easy to operate and maintain because it has few pieces. According to Toddy, their coffee maker brews coffee that is 67 percent less acidic, compared to regular coffee. Toddy T2N’s coffee is as good as its design. => Click here to buy the Toddy T2N for the lowest price on Amazon now! Click image to buy for the lowest price on Amazon now! The Takeya Cold Brew Coffee Maker brews coffee with a fantastic flavor. It makes around four servings of coffee—enough to feed a whole family, or satisfy an avid coffee lover. This coffee maker also incorporates a leak-proof, airtight lid that locks in flavor and freshness. There’s also a non-slip silicone handle, which ensures the coffee makers doesn’t slip easily from your hand. You don’t want to lose this baby you spent your hard-earned dollars on. The handle also feels comfortable to touch. 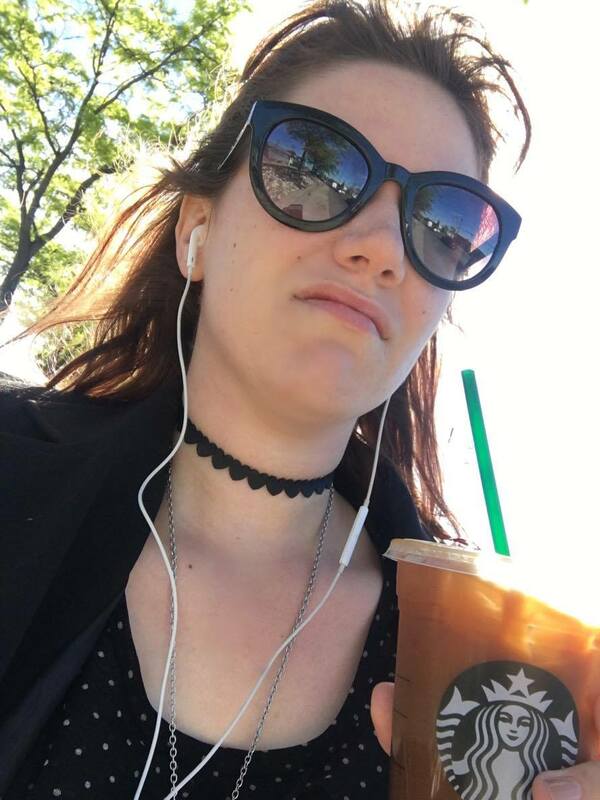 It is made with BPA free materials, so you can sip your cold brew comfortably knowing it is 100% safe. Note that cheap plastic parts retain bad odors and flavors. If you are familiar with the Hario models, you can see that the Takey Cold brew coffee maker is similar to them in a number of ways. With this machine, you can easily prepare your cold brew and slurp it down at the comfort of your home. You can also store your drink in the fridge and take it whenever you like. The only drawback with this machine is that the flavor is somewhat nutty. => Click here to buy the Takeya Cold Brew Iced Coffee Maker for the lowest price on Amazon today! Although this cold brew coffee maker is somewhat new in the market, it’s still a good match for the older products like Toddy. 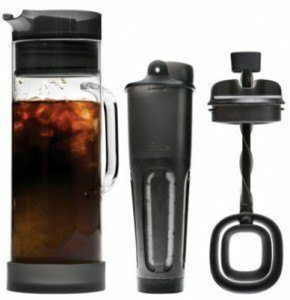 BPA free plastic has been used to make the parts of this cold brew coffee maker. The brewing container includes a rainmaker cover, which ensures there’s uniform distribution of water over the coffee grounds. The switch that opens the upper container is more convenient and modern, compared to the rubber stopper used in Toddy and Filtron. There is an auto-stop mechanism that closes the valve whenever you remove the decanter, thus preventing any coffee spillage. The filters are efficient, easy to clean, and reusable. As per Oxo’s recommendations, the ratio of coffee grounds to water should be 1 to 4. Five cups of water and 10oz of coffee give you about three cups of coffee concentrate. And when you dilute with milk or water, you get about 14 cups. => Click here to buy the OXO Good Grips for the lowest price on Amazon today! The Coldbroo Iced Coffee Maker simplifies the cold brewing process. Its parts are made with borosilicate glass and food-grade stainless steel, materials that are completely free of BPA and other chemicals. That means you get pure coffee with no off flavors and odors. The design is lab inspired, thus making the brewing process more fun. This product also comes with an easy-to-clean permanent filter, meaning you’ll save a lot of money that you’d otherwise use to buy wool or paper filters. 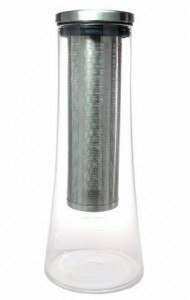 Put your grounds in the stainless steel infusion column. Fill the glass carafe with cold filtered water. Leave for 12 to 24 hours, depending on how strong you want your drink to be. Take off the infusion column and pour the brew into a glass of ice. You can add your favorite flavorings. This is one the best cold brew coffee makers on the market. It can be described as a one-stop shop when it comes to cold brewing. Your job is to add the grounds and water, and wait. The carafe has a spout lid that ensures no coffee spills pour it. The carafe is also made from borosilicate glass, a material that is resistant to short drops and temperature changes. This cold brew coffee maker fits well with other Primula products. To change your brew’s taste, you can use a flavor infusion system in place of the filter. All parts are dishwasher safe, hence easy to clean. Note that cleaning increases the lifespan of the filter. Have a look at this video which shows off some Primula products, including this cold brew dynamo! 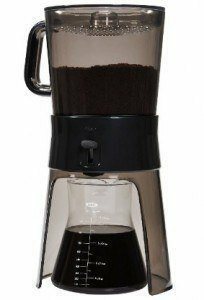 => Click here to buy the Primula Cold Brew Glass Carafe for the lowest price on Amazon now! The hotter the weather, the more difficult it becomes to sip a hot cup of Joe. A cold brew coffee maker is something you need during hot days and nights. There’s certainly no better way to cool off. Another advantage of cold brew is that it ensures you don’t get a lot of harmful oils and acids in your drink. You don’t have to put up with flavorless, watery iced coffee anymore. It is very painful to invest your time and money on a drink only for it to taste awful. We are here to save you that agony. 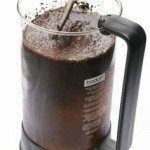 The above mentioned cold brew coffee makers will enable you to make cold brew like a pro. 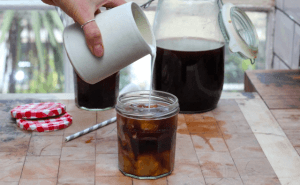 Cold Press Coffee – What Is It And How Do I Make It?